Can a 100% Private Passenger Rail Line Turn a Profit? Public-private partnerships have recently become a popular policy prescription for the prospect of reviving inter-city passenger rail. But now, a private company is setting out to do it alone – no public support needed. 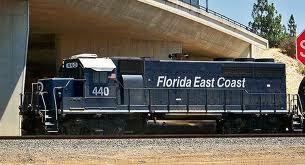 Florida East Coast Industries has announced that it will start operating passenger service between South Florida and Orlando in 2014. They’re calling it All Aboard Florida, and it comes just about a year after Governor Rick Scott rejected $2.4 billion in federal funds to build a far less ambitious 85-mile line from Tampa to Orlando. It’s no coincidence that All Aboard Florida’s 240-mile line also centers on Orlando, the most-visited city in the United States according to Forbes. (Miami is number five.) A Tampa-to-Jacksonville segment could be added on later. Amtrak has been angling to beef up its Jacksonville-to-West Palm Beach service, just a little north and east of the All Aboard Florida line — also on FEC tracks. Some observers say the All Aboard Florida initiative is a hopeful sign that inter-city passenger rail has a bright future. Most private railroads focus their attention solidly on freight, where the money is, but that’s beginning to change. “All of the Class Ones are now getting back into the passenger rail service,” former Amtrak Chairman and CEO Tom Downs recently told a roundtable in Chicago. (Downs now serves as chairman of the North American board of Paris-based Veolia Transportation.) He said Union Pacific is going after Chicago-to-St. Louis service, and Burlington Northern Santa Fe and Norfolk-Southern both want to run any passenger rail that would operate on their tracks. FECI is starting with some significant assets: The 200 miles of track between the two destinations it already owns and operates as a freight rail line. But the company is planning to spend $1 billion to upgrade its existing track and build the remaining 40 miles of track. The service will take about three hours, according to FECI’s announcement. Driving between Orlando and Miami takes about four hours. The time savings are one good reason to be optimistic that train service could be popular. The $16.70 drivers pay in tolls between the two cities also helps make train service competitive (though FECI hasn’t released ticket prices yet). Well, that sounds fantastic. We’re sure the grandmas and Germans at Disney World might be tempted to pop down to South Beach for an extra couple of days. But for one of the pitfalls of operating passenger trains on dedicated freight lines, look to Amtrak: Those trains sometimes have to pull over for hours to let a scheduled freight train keep its timetable. Which is one reason train service is notoriously hard to make a profit on. Only the dense Northeast Corridor turns a profit for Amtrak – largely because of Acela service, which has the luxury of not sharing track with freight. Paul Druce, who writes for the blog Reason & Rail, said sharing with freight might not be as onerous in Florida as it is elsewhere. While it would run on Florida East Coast Railway track, the announcement was made by their holding company Florida East Coast Industries which describes itself as a major real-estate owner and developer in the state of Florida. Looking into their holdings, we find one very prominent eight acre parcel in downtown Miami that is especially interesting. This used to actually be the location of the FEC Miami station and skirting the northern edge of the property there remains a single tracked FEC line. It also currently possesses an entitlement for up to 2.5 million square feet of mixed use development. While this area is certainly valuable enough as is, both due to its inherent location as well as its proximity to Metrorail and Metromover stations, the addition of easily accessible intercity rail connections to the rest of the state greatly boosts that value, especially if developed with an eye towards the tourist trade. Druce told me that running freight to Orlando on its new line will also be a money-maker. Transit construction is sometimes financed with taxes and fees on property owners and merchants along the route who will benefit from the line, but FECI isn’t trying to demand anything from other property owners. “Increased tax revenues from rising property values near stations can be applied towards local needs (e.g. schools, parks, public works, police and fire protection),” the company said in its announcement. Amtrak is the middle-man. If you want Amtrak to run a train, you will have to deal with the host railroad anyway, so why not just telephone them directly and eliminate the middle-man? Everyone will be paying attention to All Aboard Florida to see if it works better than Amtrak. Conservatives will look to it as proof that the private sector can operate passenger trains better than the quasi-governmental, subsidized Amtrak service. Rail advocates looking for any way to bring rail travel into the 21st century will see it as a solution. Even Amtrak, which has been trying to attract private partners, could see it as a hopeful sign that the private sector can make rail lucrative. Just a slight correction: I’ve seen reference to talks of running coal trains which would have been at that speed, but to my knowledge they did not end up doing so, although they do run aggregate trains that fast. This can be extrapolated to a hopeful lesson – if you removed subsidies on intercity roads by charging use fees that fully funded them, then private alternatives can compete with driving without subsidies. I’m guessing the $16.70 isn’t actually enough to fully fund the roads, and if you did this the higher toll would make alternate modes even more competitive. The great thing here is that you don’t have to put all your eggs in one basket – tolls should encourage rail, intercity buses of all kinds, carpooling, etc. And if one private operator picks a poor route, doesn’t operate on time, has bad customer service, or racks up massive cost overruns in construction, taxpayers aren’t on the hook for it and will simply go to its competitors. Note to New York readers: that isn’t all. CSX operates the Empire Line, the most important rail line in New York State, and they aren’t mentioned. Norfolk Southern holds rights to the former Erie Railroad along the Southern Tier. @f9d50cda7e99dd6c29a986b30d8128d3:disqus Your comment is positively brilliant! The incentives created by usage fees often work in different ways than subsidies. It’s smart for governments/policy makers to use a mix of the two. Private trains will never work and AAF knows that. I’m sure they have plenty of motivations, but running a train that they pay for themselves is not one of them. To the naysayers I say this- look how long FEC has been around. I’m sure they can handle this. Passenger trains on routes of heavy volume (similar to the Orlando-Miami market) make money in a number of areas of the world. Without Amtrak’s legacy costs, trains can be operated cheaply (think Southwest) and good marketing will fill the trains. As it is, Amtrak is already making money in the northeast corridor. What do people mean when they say “a warning shot to Amtrak”? I highly doubt Amtrak prefers being underfunded (“undercapitalized” in the parlance of private operators) for the past few decades. A “warning shot” to Congress, perhaps, but half of them couldn’t care less. That’s actually great *even heaven* for commuters and vacationers who want to pop down to South Floridabut you’ll still need a car to do you’re groceries because trains only stop at desginated spots then you have to walk or rent a car to travel the 8 blocks to the Safeway for basic food supplies or Costco if you buy things in bulk. But the*Gasp* but Communism or Socialism which is semi-Communist HATES competition! Competition is bad for you!………At least according to the Reich. In the days of private passenger trains during the Turn Of The Century there wasn’t as much motivation for passengers to travel………at least not out of state. We didn’t have all these tourist traps though there were theme parks but they didn’t have as big of an impact until the mega parks came into existence then the smaller ones starting getting more attention strangely enough. simple answer. no. It cannot be profitable. That is why private companies don’t do this, unless they have a government partner to absorb the losses. The government has created the environment with subsidized competition and also unacceptable risk (liability and permitting for new projects). That is what has made profitable privately run passenger train operations difficult. It could very well be profitable on an even playing field without subsidized competition, it’s only that we made a choice as a country not to go that route. Nor do I see us changing that choice, but we could. Passenger rail has NEVER been profitable – that is why the feds agreed to take it over in ’71. The freight railroads wanted out but they were obligated to provide it as a condition of eminent domain – you do know that all the land for the 300K+ miles of track in this country was taken from the people by the government right? No form of transportation is profitable. Not the highway and not the airline industry. For decades the gov has poured trillions into road building. Talk about subsidies. To demand rail break even outside the north east is absurd. For the time being. Build high quality and high speed rail throughout the east coast and Midwest and you’ll see more people using it. In fact people are already moving back to cities and diching the car. The comment about passenger rail never being profitable is absurd. Look at the incredible rail networks built for passenger systems long ago. The h and m for example. They had their own power plants. This wouldn’t have happened had they not made money. No one is against competition. Competition is a good thing. Just because someone is libereral doesn’t mean they’re communist. Silly rabbit. No, a private passenger rail line cannot turn a profit — by itself. HOWEVER, if the railroad owns a bunch of land adjacent to the stations, they can turn a profit on *developing that land*. The railroad changes the land from low value to high value. This is what Florida East Coast / Brightline is doing.